Thanks to take time to visit our Web page, where you will found the information of your interest, that it guide you how we work, as well as you can find the most important handball links. Also you can visit the personal page of Tatjana Medved, handball player and founder of this activity of the company. Sport & Marketing of Santa Trade S.L. dedicates to the representation and management of professional athletes, particularly female handball players, as well as the advising on sport marketing. Since 2002, when beginning this activity, we have been evolving along with the evolution of handball generally, but mainly of female handball. The management that we facilitated to you guarantees that the sport contracts and the contracts of the image rights fiscally are well done, for easy and comfortable fulfilments of the contracted obligations. We are to your disposition to solve any problem or situation that can arise. In last decade, every season the teams of the European leagues, specially from Denmark, Norway, France, Montenegro, Slovenia, Serbia and mainly Spain grew with more ambitions, putting all the forces to improve the budgets, to have better team, better conditions, so could become the prestige Club to which the players could have much interest to playing for them and enrich their sport carriers. Woman handball is becoming into a prestige sport. The European Federation of Handball (EHF) year by year is taking more participates in the promotion of the woman handball. European and World Championships are already powered by best sport broadcast - EUROSPORT. European Clubs competitions, under dominion of EHF, beside of Champion League, are getting more importance, which raise more interest between the European Clubs to assure place in their respective leagues for participation in European Cups. The Clubs, the absolute majority of the elite leagues, have become to Clubs with serious objectives, with projects of long term, and therefore they fulfill the contracted obligations. But simultaneously, in return, they request the responsibility, sacrifice, professionalism and mainly the honesty of the players whom they contract. By such reason, but mainly because of oneself, the most important thing is that each player enjoy handball, is a born winner, shows continuous desire to surpass itself and is a true professional. At the end, the jewel of the crown are the results that write history. And if you are participant in that history, you will have the best reward for all the sacrifice, suffering and hard work that you had throughout in your sport carrier. As well improved the Clubs and the Players, the sport agents had to follow the same line. They are forced to carry out their work more professionally. We afforce ourselves to work seriously with each Player and the Club. 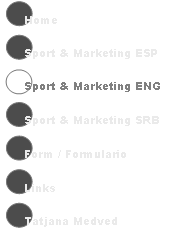 We are working in projects of association with the best companies in Europe in management of sport marketing. We want to grow for in future be best in sport representation and management of sport marketing. “Being player and guiding me by my own experience as a professional and international player, I saw how important is to have a good sport adviser. Because I believe that any professional player only must dedicate itself to be in the best possible form, to take care of itself, to be able to fulfill with its sport obligations. All the extra sport, economic and legal managements, contract conclusion, as well as knowing in which team fits your profile as the player, would have to take care your agent or representative, who has good knowledge of handball generally” - explains the founder and the representative Tatjana Medved. And therefore, our policy of work first of all is based on understanding, respect and mutual confidence as well between the Representative and the Player, as the Representative and the Club. “The Players for me are not clients, first of all they are persons, and therefore it is very important to me, beside of the sport and extra sport advising, to understand me with each one in particularly, to be able to help and advise well all their needs on the best possible way.” - concludes Tatjana Medved. To make contact to us, please fill the form. Our telephone numbers as well as the email, would find at the end of each page. Thanks to trust us !